Apple(R) today announced ResearchKitTM, an open source software framework designed for medical and health research, helping doctors and scientists gather data more frequently and more accurately from participants using iPhone(R) apps. World-class research institutions have already developed apps with ResearchKit for studies on asthma, breast cancer, cardiovascular disease, diabetes and Parkinson’s disease. * Users decide if they want to participate in a study and how their data is shared. 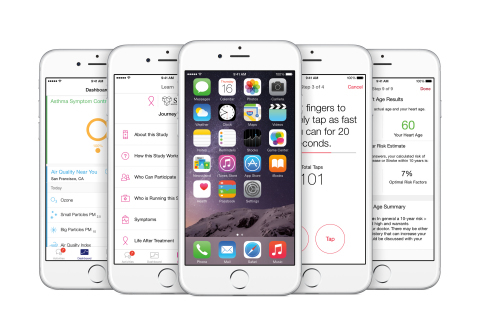 ResearchKit turns iPhone into a powerful tool for medical research. When granted permission by the user, apps can access data from the Health app such as weight, blood pressure, glucose levels and asthma inhaler use, which are measured by third-party devices and apps. HealthKitTM is a software framework Apple introduced with iOS 8 to provide developers the ability for health and fitness apps to communicate with each other. ResearchKit can also request from a user, access to the accelerometer, microphone, gyroscope and GPS sensors in iPhone to gain insight into a patient’s gait, motor impairment, fitness, speech and memory. ResearchKit also makes it easier to recruit participants for large-scale studies, accessing a broad cross-section of the population-not just those within driving distance of an institution. Study participants can complete tasks or submit surveys right from the app, so researchers spend less time on paperwork and more time analyzing data. ResearchKit also enables researchers to present an interactive informed consent process. Users choose which studies to participate in and the data they want to provide in each study. Massachusetts General Hospital developed the GlucoSuccess app to understand how various aspects of a person’s life-diet, physical activity and medications-affect blood glucose levels. The app can also help participants identify how their food choices and activity relate to their best glucose levels, enabling them to clearly see correlations and take more active roles in their own well-being. *ResearchKit apps are available on the App StoreTM in the US at appstore.com/researchkit and will be rolling out to more countries in the future. iPhone 5, iPhone 5s, iPhone 6, iPhone 6 Plus and the latest generation of iPod touch support ResearchKit apps. (c) 2015 Apple Inc. All rights reserved. Apple, the Apple logo, Mac, Mac OS, Macintosh, ResearchKit, iPhone, HealthKit and App Store are trademarks of Apple. Other company and product names may be trademarks of their respective owners.